‘The Munsters’ Re-Boot Officially Kaput! Jerry O’Connell and Portia De Rossi’s reboot of classic TV show The Munsters has officially been axed despite drawing millions of viewers over Halloween. 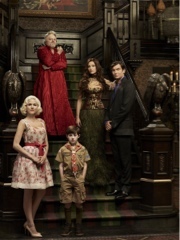 The cult 1960s series was revived as Mockingbird Lane starring O’Connell as Herman Munster, De Rossi as his vampire bride Lily, and Eddie Izzard as Grandpa Munster. However, bosses at NBC had a mixed reaction to the finished product and put the sitcom on the back burner. They aired the pilot episode as a Halloween special in October, drawing more than 5.4 million viewers, but TV executives have now decided to axe the project for good. Ellen DeGeneres has reportedly closed on the $12 million Malibu, California estate formerly owned by Brad Pitt. According to People, the television host and her wife Portia De Rossi will downsize from the formerhome, a $49 million Beverly Hills palace. The couple will take over Brad’s 4,000 square foot bungalow, which boasts ocean views, private beach access, a pool and tennis court. Pitt bought the four-bed, four-bath home shortly after his split with Jennifer Aniston and originally listed it for $13.5 million.